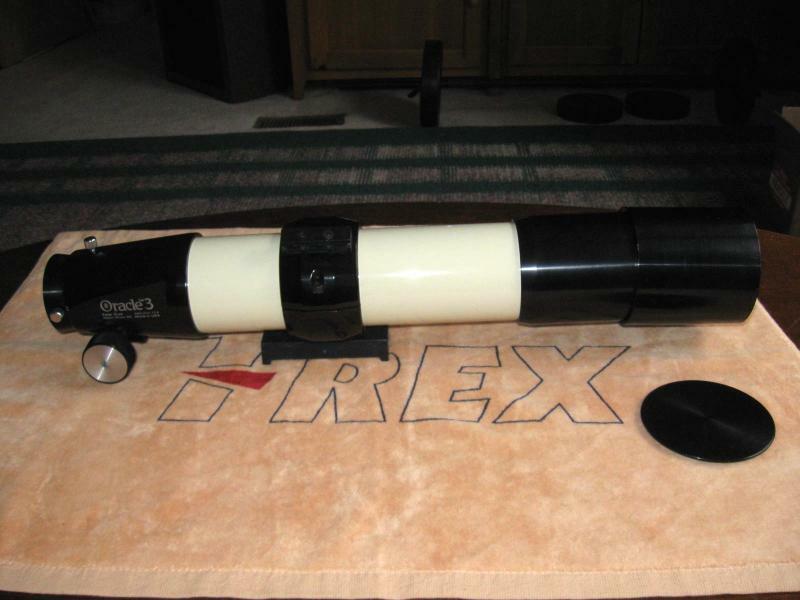 If your Edmund 4" refractor is anything like mine, you are really going to like it! P.S. Love the red tube, too! I don’t think they made a bad one! Certainly not any Edmund refractor I’ve heard of. I sure enjoyed my 4” F15 for the four or five years that I had it. Edited by terraclarke, 16 January 2019 - 04:02 PM. and so Fed Ex arrived as scheduled and we were not disappointed. YEAH!!! Glad it arrived safely!!! Can hardly wait to hear how great it is! Congratulations on a beautiful scope. I miss mine, but with the FS-152 I really couldn’t justify keeping it. Technically, I suppose I actually replaced it with the FCT-125. Congratulations Tom! Despite every scope I've bought & sold, my Edmund 4" F15 is still my favorite. It is Classic in every sense: age, optical quality, & simplicity. On its original mount, I glide from object to object -- so smoothly that it's like I'm holding it myself. On a motorized mount, I can sit for an hour, soaking in the fine details of Mars, Jupiter, or Saturn at 300x. It delivers on every object. I have scopes that'll out-perform it, but not with its combination of aperture, light weight, ease of use, and reliability. Wow!! Two beautiful Taks! So... how do you decide which one to use? Picked up this large eyepiece off eBay. I haven’t seen too many of these around. Rainy, so can’t try it out for a while. 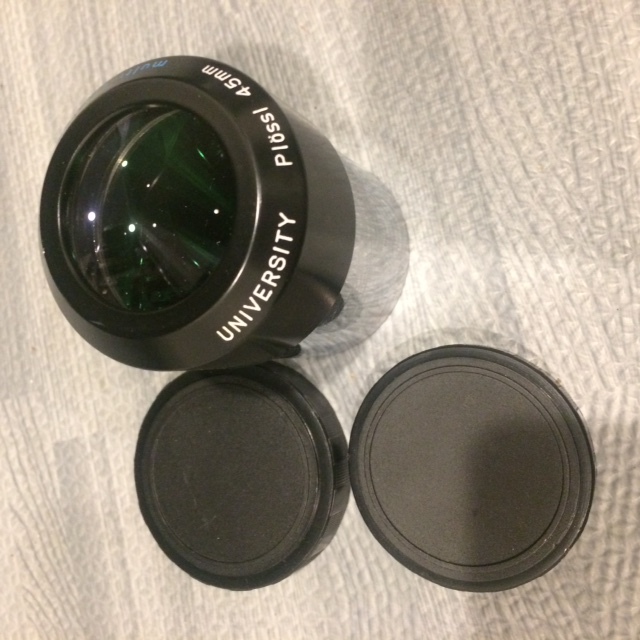 University Optics 45mm Plossl with a 2” barrel. It is multicoated. Edited by Esso2112, 16 January 2019 - 10:20 PM. Wow, holy cow, that is so totally awesome! Great find! You have started down a very slippery slope. Classics are addictive. Taks are beyond addictive. Just look at the Takitis post in the refractor forum. Thanks. It is a nice chunk of glass, but not really that heavy. Edited by AstroKerr, 16 January 2019 - 11:32 PM. Let me know, does it have something in common with modern Celestrons Astromaster 90/1000 (93 in fact...)? I don't know modern scopes that well, all I know is I have a new appreciation for Chinese mass-production. 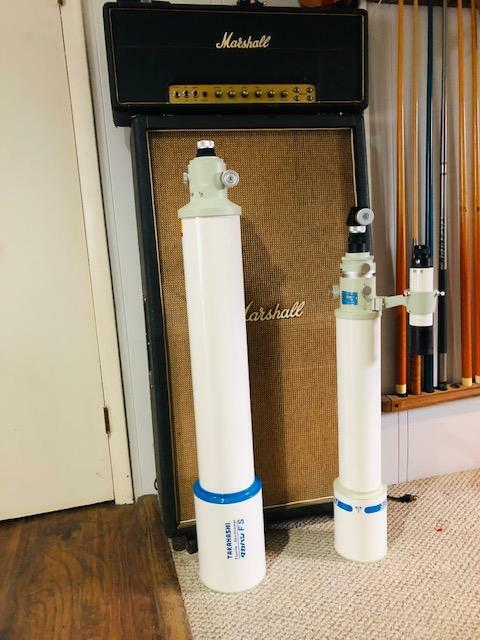 Here's my Televue Oracle, the dew shield is a little saggy, other than that seems in nice shape! Edited by Mike W, 19 January 2019 - 05:23 PM. Anyone up for a guess? p.s. I promise to not string it out too long. Edited by Kasmos, 20 January 2019 - 09:43 PM. 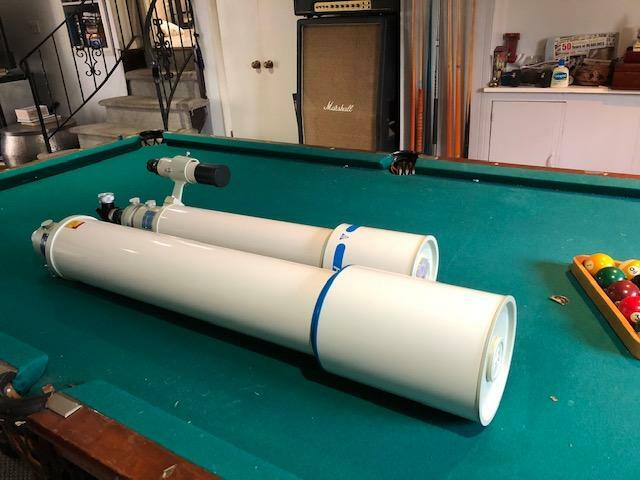 Let me guess..........It's a... TELESCOPE ?!?!?!? Perhaps we will know after the eclipse? Based on the latches, I would say Unitron. Edited by Defenderslideguitar, 20 January 2019 - 11:04 PM. Nippon Kogaku and Goto also used that hardware. Watcha get? Edited by strdst, 20 January 2019 - 11:21 PM. There is a cross over year 142 from 1963 that has those latches on the tripod legs case only in the herd. If everything is included in one box I would guess a block lettered 114. Edited by Bill Griffith, 21 January 2019 - 12:13 AM.